It started with three graduates from a small liberal arts university in Pennsylvania that wanted to put more than just a form letter in their 2009 Christmas cards. Then we were the house band for a local theater’s annual Christmas show. We’ve now become an amalgam of our best and brightest friends who have contributed to nearly thirty Christmas covers across two albums and an EP. We believe in joy to the world, in the spirit of the season, and that it's better to give than to receive. That being said, we've crafted more than two dozen Christmas covers (and some bonus original material) spanning two CD's and one EP for our family, friends, and fans. We're pretty pleased with the results, and we plan to do more of it! We're also prone to adding live shows during the holiday season, so be sure to Fan us on Facebook to keep up with the awesome to come. Enjoy our sophomore release, "Christmas Spirits" and be sure to download our third album "Stocking Stuffer Sampler" and first album "Happy B-Day Jesus," also available from Noisetrade! Christmas Spirits was recorded, mixed, mastered, and produced by Kevin O'Boyle (with help from Alexis Leon & Angelica O'Boyle), mainly at Kevin's home studio, with several satellite ventures to The O'Boyle residence in Scranton, PA, St. Maximillian Kolbe in Pocono Pines, PA, and Touchstone Theatre in Bethlehem, PA between October 2010 and October 2011. 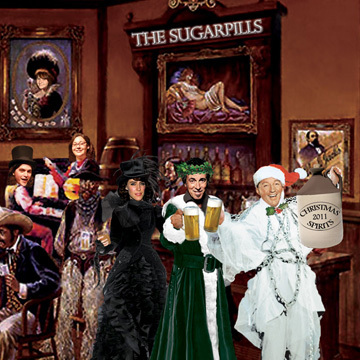 The Sugarpills would like to thank everyone for their time, talent, energy, and creativity in creating what we consider to be our finest masterpiece yet. Extra super special thanks to the Touchstone Theatre Ensemble, without whom large chunks of this album wouldn't have been possible (or at least wouldn't sound so awesome). All song composition credits and rights belong to the original artists.